Before I begin, I need to make it absolutely clear that I was hesitant in writing about this episode. Not because I didn’t have much to say, or because it didn’t affect me; quite the opposite in both of those regards, to be perfectly honest. It’s just that everything I’m going to reveal in this article is so pretentious and awful and disgusting that you’ll loathe me to the point of sheer hatred. You’re going to doubt the authenticity of what I’m about to admit, either due to denial or the hope that I’m not legally insane. I would make fun of anybody else for writing this same deconstruction, so I’ll wearily admit to my hypocrisy now. This is your warning. I’m sorry to spoil the grace and holiday charm you were possibly expecting, but this is going to be the worst thing you have ever read. 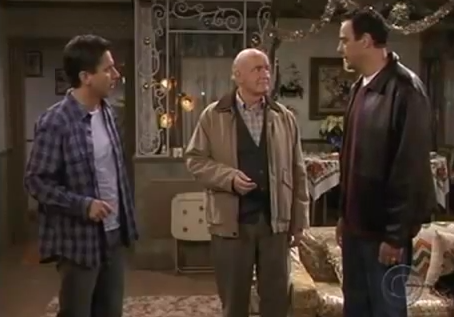 An episode of Everybody Loves Raymond changed my life. The show in question revolves around Ray trying to make up for a disaster during one of his childhood Christmases – the accidental destruction of his father’s Jazz records. He purchases digital replicas of the music he ruined those many years ago, but the new technology scares his father and he’s insistent on having nothing to do with them. This is where I used to listen to ’em. I’d come home from a hard day’s work, your mother would mix me a drink, I’d come down here, put on the hi-fi, and let Duke and Dizzy take me away. …From your mother. Without going into too much detail, growing up I wasn’t what you’d refer to as a model student. We’re all aware of that humiliating rebellious stage most teenagers go through, and mine was just as embarrassing. I rarely showed up to class, soon found myself expelled, and spent the rest of my days doing nothing society would deem constructive. This should be the part of the story where I find God, or journey through a traumatic experience and rejuvenate as a stronger and changed person. In reality, I watched a mediocre television sitcom. 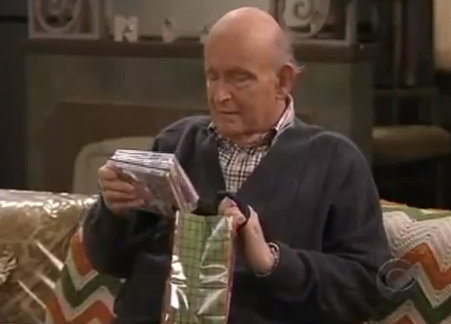 With Ray’s remastered albums failing Frank, Robert saves the day by giving him some of the original vinyl copies he lost long ago. The episode closes with Frank finally listening to his old records again, sitting relaxed in his chair, lost in the music, naught a whisper emerging from the other Barones (a rare occurrence, by the way). The only sound we can hear is “Bye Bye Blackbird,” played with the grain and warmth Frank had been looking for since his records were originally destroyed. “Now that’s music,” he remarks. And I agreed. It was. I didn’t know why at the time, but it was different to any musical performance I had been exposed to before. During my entire life I had no interest in any “deeper” art forms (again, it’s hard to write this without sounding pretentious), but from that final scene things began to change. I was moved. I wanted to delve deeper into the jazz culture. I didn’t make the connection at the time, but I wanted to turn my life around. And then the studio audience laughed. It’s weird, because it clearly wasn’t the first time I was exposed to jazz. The Simpsons, one of my favorite and most re-watched series ever, had produced numerous episodes on the genre, yet I never thought twice about the stuff. And yet here it was, touching my soul in a bloody episode of Raymond. One hobby lead to another. From jazz I found myself interested in art, and then English, and soon I finally discovered the joy of learning – somewhat regretting all of the classes I skipped back in high school. I made up for them with university, and these days when I come home from work, I relax and listen to my jazz records, just like Frank. Not because he did it, mind you – this article doesn’t have to be that depressing. I find it’s the best way to begin the ending of my day, a chance to reflect, meditate, and enthrall myself in the music. Okay, so I opened this article with some humor – I’m more than content with the fact that this show changed my life, since being largely influenced or affected by any type of media is a common occurrence. Even though I like to keep myself educated, these days I don’t wall myself off from anything I’d preconceive as a waste of time. My girlfriend wanted to take me to the ballet recently – I said no to that, but, like, if she suggested the opera or something, I would have said yes because who knows what such a performance might bring? It could change my life, or it could do nothing. Either way, I had the experience. 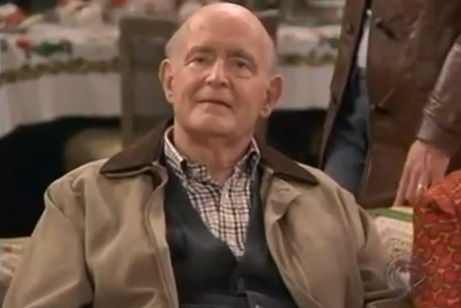 I was never a huge Everybody Loves Raymond fan, but had always thought Peter Boyle did a marvelous job, the actor also being the only cast member who I held an appreciation for outside of the series. I think that’s why I was affected by the episode more than I should have been, as well. Frank is a cold, angry, emotionless character, and yet his jazz music would break down all of these traits and leave us with somebody completely different. I admit it — it was a beautiful thing to see. Tomorrow: It’s that one where the character isn’t really a big fan of Christmas, and is kind of a jerk about it, but then learns to enjoy it. You’ve probably never heard of it. A lot of comedy snobs (a group in which I include myself) have completely written off Everybody Loves Raymond, but when that show was firing on all cylinders it was as good as any comedy you’ve ever seen. The “jazz records” episode is only one example of how brilliant it could be. The last truly great laugh track sitcom. I don’t know if I can concur with that. Considering that the premiere of Stravinsky’s ballet “Le Sacre du Printemps” concluded with a riot, I think it could be a much more exciting time than an opera, especially since, according to Wikipedia’s page on “classical music riots”, there’s only been one notable riot stemming from an opera in the past hundred years, with at least three riots stemming from ballets…of course, there have probably been more than that in general, but I tend to be biased against opera as a form (although I can understand a bias against ballet as a form as well, I tend to think that the musical works which define ballets generally stand much better on their own, if not more so, when derived of their visuals than operatic works do), so take my opinion as you will. All jokes aside, though, I do have to ask: who do you listen to in the jazz world, and what is it you hear? People always tell me they find jazz relaxing, but I’ve always felt the opposite, so I’m a little curious about why people find it relaxing, since I really find it to be incredibly invigorating. At its best, the musical ideas which are present cause me to constantly listen to what is happening and to maintain a vested interest in the development of each piece as it unfurls.